One thing that I really liked about Ukraine is that a lot of the food and traditional dishes are pretty darn Paleo. So, a lot of foods take little or no adaption to make them healthy and nutrient dense. (Our ancestors were onto something…) This salad is one of those dishes! 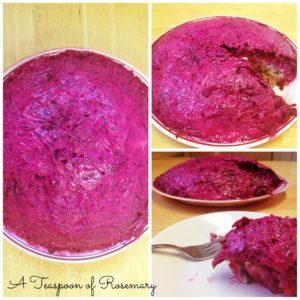 It’s called ‘herring under a fur coat’ (selyodka pod shuboi/cеледка под шубой, or simply shuba/шуба). 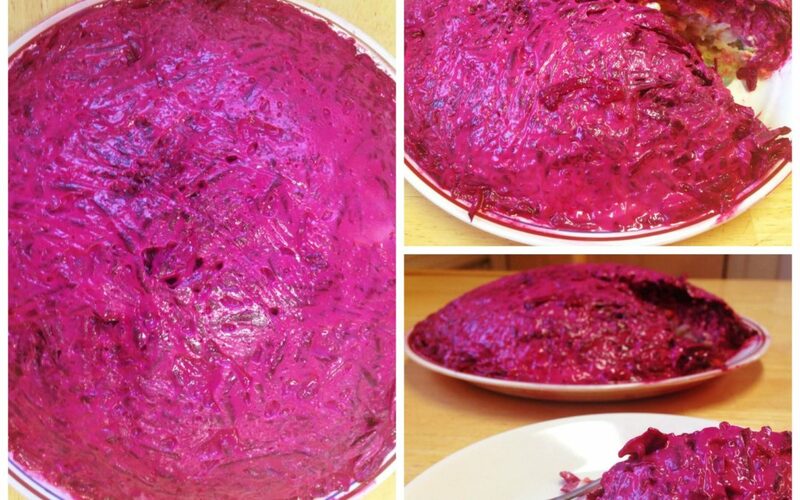 It’s a colorful layered salad with diced herring, onion and grated boiled vegetables under a red ‘coat’ made of beets and mayonnaise. It’s customary to have this on New Year’s and Christmas, in addition to a bunch of other cold salads. So, if you are looking for something different and adventurous to try this holiday season, give this one a whirl! Or, you know, if you’re reading this in April, still make it. It’s really good. I promise. If you’re squeamish about herring, or you can’t find it, just used diced cooked chicken; it will work just as well. There are lots of variations to this salad, but this is the version that I like the best. Since I move like a 90 year old lady when I have nightshades, I opted for sweet potato instead of regular potato. And, I used my homemade mayonnaise (friends don’t let friends eat refined seed oils!). You do need to do this one ahead of time to allow the salad to chill and for all the layers to compact enough so you can see them when you cut into it, so plan accordingly! Boil the potatoes and carrots in their skins in one pot until soft, but not mushy. Boil the beets in their skins in another pot until they are soft as well. The carrots will be done first, so they should be removed when they are done. The beets will take the longest. Remove from the pots, allow to cool enough so you can remove the skin. Grate the beets and carrots and dice the sweet potato. Plop the potatoes in the middle of a serving platter and pat to flatten. Spread a third of the mayo on top. Then, in layers, add half the carrots, then half the beets, then half the onion, then another third of the mayo. Each layer, pat it to flatten it down and compress it. Imagine that you're building a seven-layer cake, but uh... made of vegetables and fish. Add the remaining half of the onion, then carrots. Add the remaining mayo, then layer the remaining beets on top. Press to compress everything and smoosh it down, shaping it into an oval or circle or however you want it. Cover in plastic wrap and allow it to chill in the fridge overnight or at least 6 hours. Serve garnished with a sprig of parsley or dill.